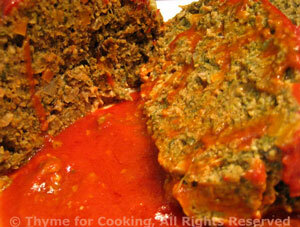 Meat Loaf Florentine, studded with spinach, Thyme for Cooking easy main course. 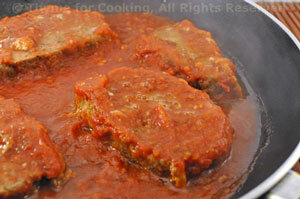 While this meat loaf is chock-a-block with vegetables it still retains the 'proper' meat loaf taste and texture. We'll eat it for 2 meals - and there may be enough for a couple of great sandwiches as well. I actually used about 19oz (540gr) in this because I had some bits in the freezer to use up. Finely chop onion, carrot, celery, mushrooms and mince garlic. Heat oil in large nonstick skillet over medium-high heat. Add onion, carrot, celery, garlic and sauté until they start to get tender, onion will be transparent, about 8 minutes. Add mushrooms and frozen spinach; the heat from the skillet will thaw it. Cook spinach and vegetables, stirring frequently until spinach is just thawed and mixture is well combined. There should be no visible liquid from the spinach. Remove and spread the vegetables on a plate to cool slightly. In a large bowl lightly beat eggs. Add crumbs, wine, ketchup, herbs and mix well. Add about a third of the vegetables and mix (because the veg are hot we are adding them slowly). Add remaining vegetables, mix well - at this point it's best to use your hand, kneading it like bread dough. Put into a baking pan large enough to hold it easily, with room all around, and shape into a loaf. Cover and bake at 400F (200C) for 45 minutes. Remove and pour tomato sauce over the top. Bake, uncovered, 15 minutes longer or until done. Remove, let rest 5 - 10 minutes. Slice and serve. Or just warm up in the leftover tomato sauce.